Hawaii – day 6 | brian habbe | life ..
Monday was the last full day before the rest of the family left. Kay was going to do a helicopter tour but we were not able to call on Sunday as the Road to Hana, did not have cell service (Sprint). A few calls in the morning turned up no openings and it was to be expected it was the first day since we had been there the sun was out with few clouds in the sky at sunrise. So it was off to Kanappali beach as the rest of the family was there the day before we arrived and wanted to go back. Even though some of us were still tired from all the relaxing…. The parents went shopping as we headed out to find a spot and my sisters family followed shortly after. When the parents showed up with a volley ball my nephew was looking for a game. Needless to say after five minutes it was on to something else but that caught the interest of another vacationer and we continued… two on two for about 20 minutes. This would not be worth mentioning, other than to say we played a little sand volley ball, but what followed is. You see the sun is bright and you need “sun block” on most places that are exposed, one place that sometimes is overlooked is the tops of your feet. 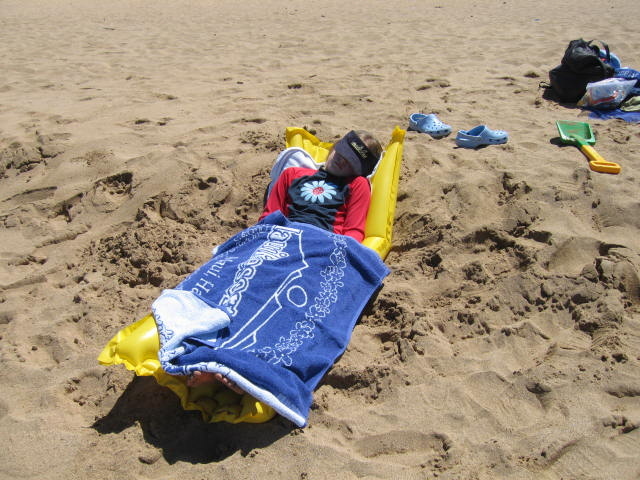 So moral to the story today is if you’r going to be out in HI at mid-day and not in the shade or the water… use a little protection on the ski’s.